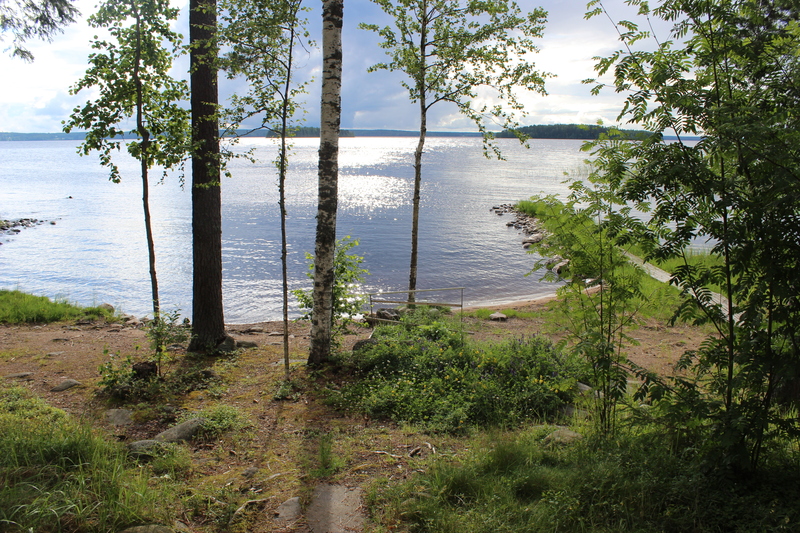 It has been almost one week since I arrived at the summer house in Finland. The routine kicked in fast. The wake-up between 9 and 11 o’clock, porridge with berries while watching the lake view, walking the baby in the woods (she seems very impressed by the surrounding tall pines and spruces), cooking lunch, cutting wood, observing birds, arranging the boat garage, heating up the sauna and preparing dinner (often Grilled vendace: a typical Finnish meal after sauna). I usually go to sauna around 9 o’clock in the evening, after putting my daughter to sleep, and return to the kitchen to cook while my parents have their turn at the sauna. The weather hasn’t been warm enough for drinking rosé wine at terrace but we have enjoyed red wine from Luberon and biodynamic red from Languedoc-Roussillon (Domaine Cazes, Cuvée Marie Gabrielle 2011). Life is sweet here and will only get sweeter when my husband arrives some time next time. No need to look further for peace and calm. Finnish lake scenery at its best. It is 7 o’clock in the evening as I am typing this. Time to cut wood and heat up the sauna! PS I will be here for several weeks, so stay tuned for more stories about the life at the Finnish summer house! This entry was posted in Uncategorized and tagged biodynamic wine, Finland, food, Languedoc-Roussillon, nature, organic wine, summer house, wine on July 14, 2015 by Miia. 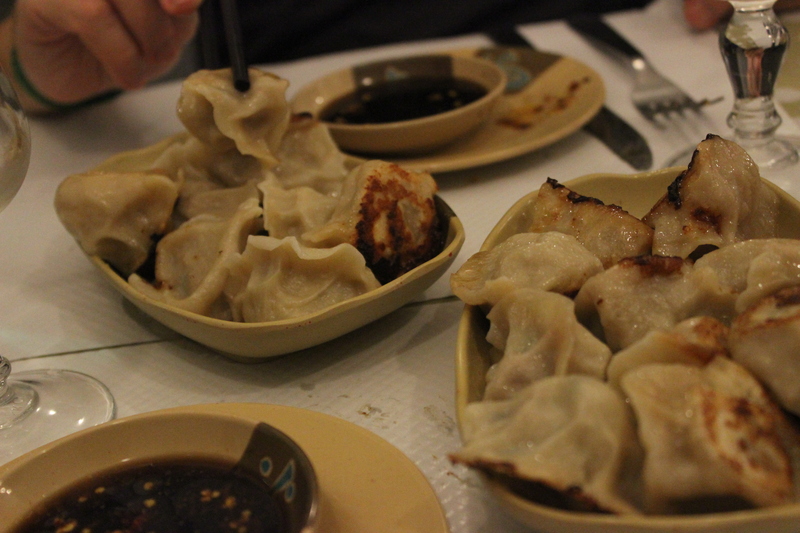 Chez Van looks a bit more than a hole in the wall in the 13th arrondissement of Paris (bordering the 5th), but inside one finds a heaven of regional Lanzhou food (north-western corner of China). Secrets behind this popular restaurant are numerous. Madame Van hand-pulls the noodles in the kitchen and if you get a table at the rear end you may get a glimpse of her. Lunch menu costs 10€. At dinner you pay 2€ more. A la carte options are available, too, but most customers opt for these delicious unlimited meals. We have visited Chez Van twice in the past month and both dinners have been delicious. Everything is quite speed. 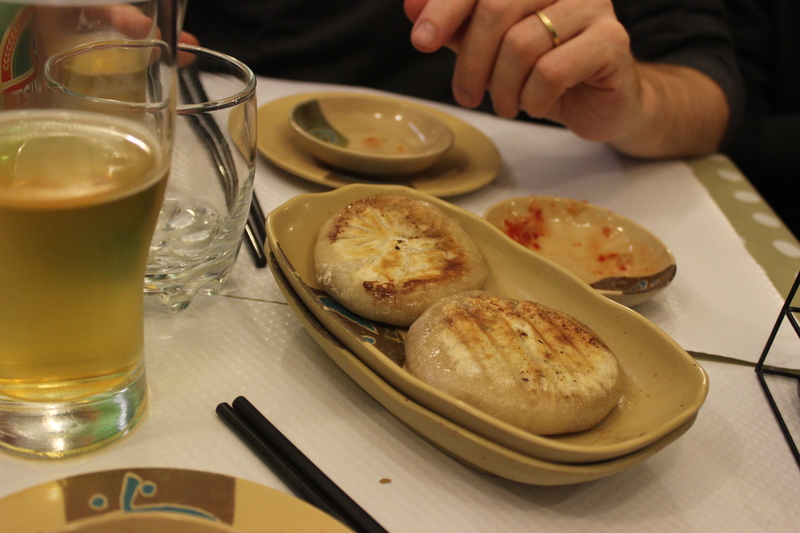 At first the vegetarian nems arrive, followed by delicious “mini pizzas” (beef, pork or vegetarian). I think my favorite is mini pizza of beef, which has leek in it. So yummy, so original! After the nems and the pizzas, a huge plate of raviolis is served. Again, the choice is between pork, beef and vegetarian. I really like the raviolis because they taste homemade and light (I really dislike when food soaks in oil). The meat tastes of good quality. Excited and hungry, we are getting explanations from the manager about the sauces and what goes with which dish. 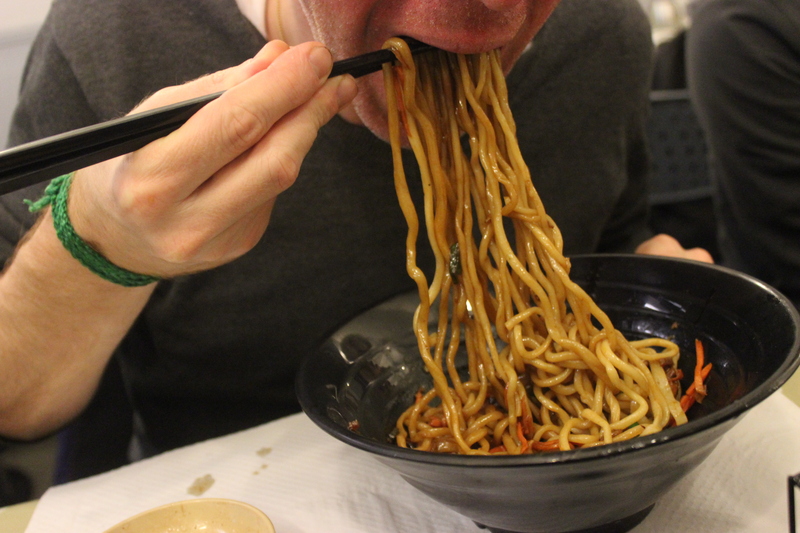 The famous noodles come in the end. Sauteed or soup; beef, pork, chicken or seafood, these are the questions. Everything looks really tasty. So far we have tasted three types of noodles and my favorite is noodles with sesame sauce and cucumber. 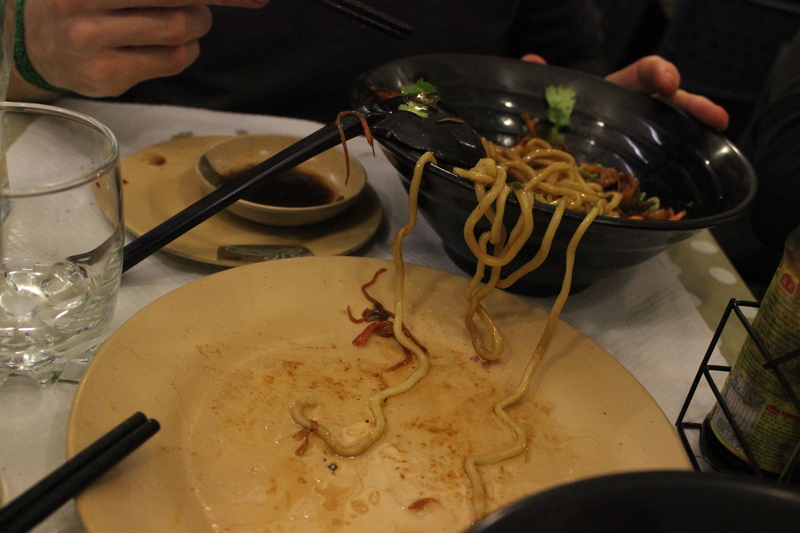 My husband has had noodles with beef with carrot, and noodles with shrimp, both excellent. We have never been able to order additional food but you do have a right to eat as much as you like –just don’t leave anything on your plate as you may be charged for it! Eating at Chez Van is a lot of fun –and messy (do not wear a white shirt)! It is a lovely addition to the Parisian restaurant scene and I believe that the 10/12€ menus are the best deals one can get in Paris for food this delicious. So, hurry up before everyone hears about this place and Madame Van doubles her prices. Reserve or arrive very early. If you do not get a table, then order take away. The wine list has nice choices, including many organic wines. We opted for a pichet of rosé from Var, south of France, and thought it paired very well with what we ate. CHEZ VAN: 65 Boulevard Saint-Marcel, 75013 Paris. Tel. 01 43 37 05 97. Metro: Les Gobelins. This entry was posted in Uncategorized and tagged China, food, organic wine, Paris, restaurant, wine on July 1, 2014 by Miia. Wine Exhibition of Independent Winegrowers is back! Is your wine cellar empty? 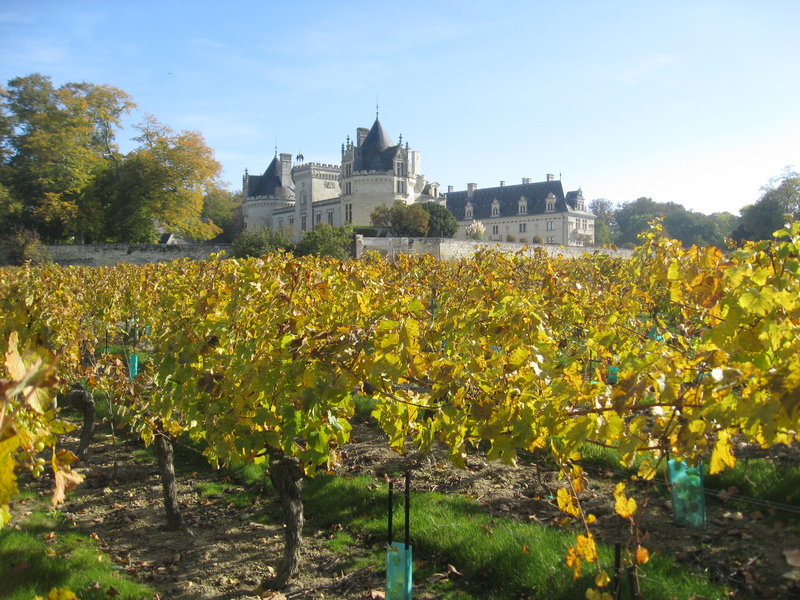 Good, because the Wine Exhibition of Independent Winegrowers returns to Paris this weekend! More than 1000 winemakers from all over France will present their products, often organic and biodynamic, and always of high quality. It is a dream event of all wine lovers and not to be missed! As previously, I have an extra ticket and happy to send it to someone interested in participating the exhibition between March 28-31. It is for two people and includes complimentary wine tasting glasses. The rules are the same: like Pearlspotting on Facebook, or if you prefer, become my blog’s follower by inserting your email address into the box available on the front page of my blog (https://pearlspotting.wordpress.com). Please write a comment or a brief story about your most memorable wine experience. Do not forget to mention the name of the wine the story involves (if you remember). Can be from anywhere in the world. At midnight Wednesday (Paris time) I will pick up the winner (call it Internet lottery) and contact this person. Next day I will send the ticket to the address of the winner. I am looking forward to your wine stories, and meanwhile, my previous posts about this wine exhibition are to be read here: Wine tasting at Salon des Vins des Vignerons Indépendants and Maison Lorgeril from Languedoc-Roussillon. This entry was posted in Uncategorized and tagged biodynamic wine, champagne, France, organic wine, Paris, wine on March 24, 2014 by Miia. 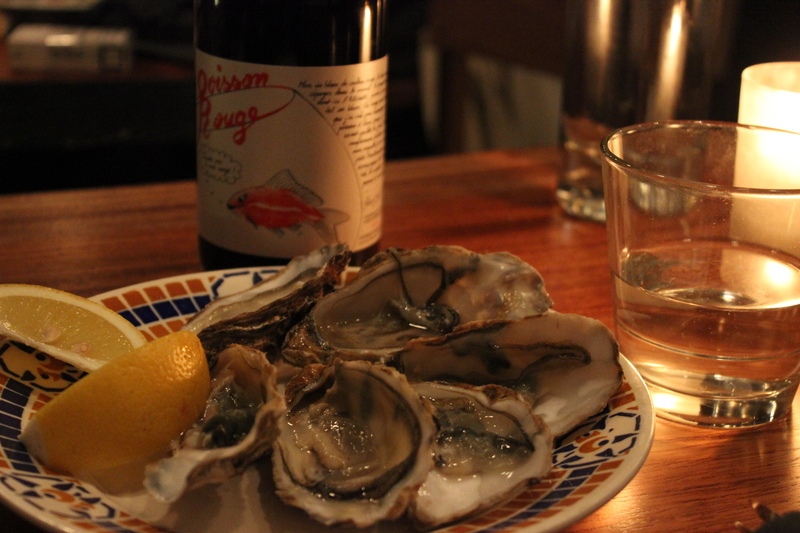 Les Nautes is one of the latest additions to the Parisian restaurant scene. 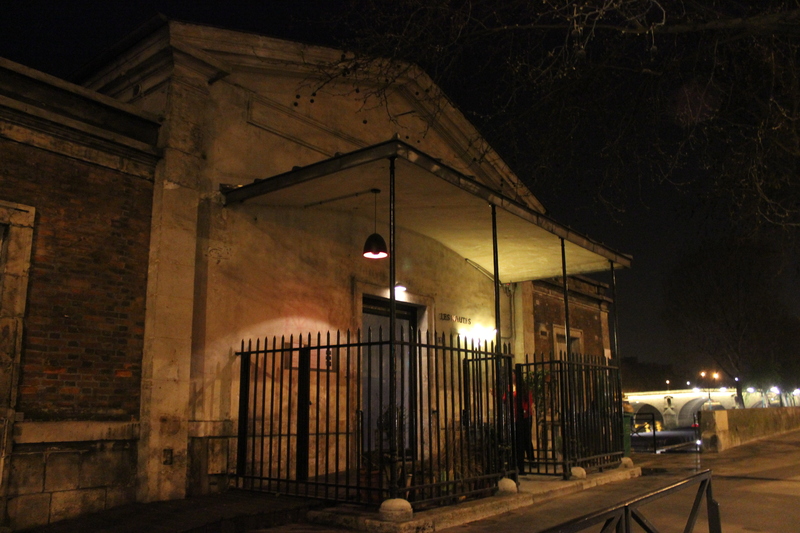 Located right by the Seine and in front of the Île Saint-Louis, this old customs house has an industrial feel to it. I loved its unusual entrance. Once inside, I admired beautiful wooden tables, 13 pendant Alvar Aalto lamps (golden, like we have at home!) and art pieces (sculpture and paintings) by young artists. Bravo for the original decoration! Recommended by Le Fooding, our food bible to eating in Paris, Les Nautes had been on our list since its opening last October (the bar opened one year earlier). 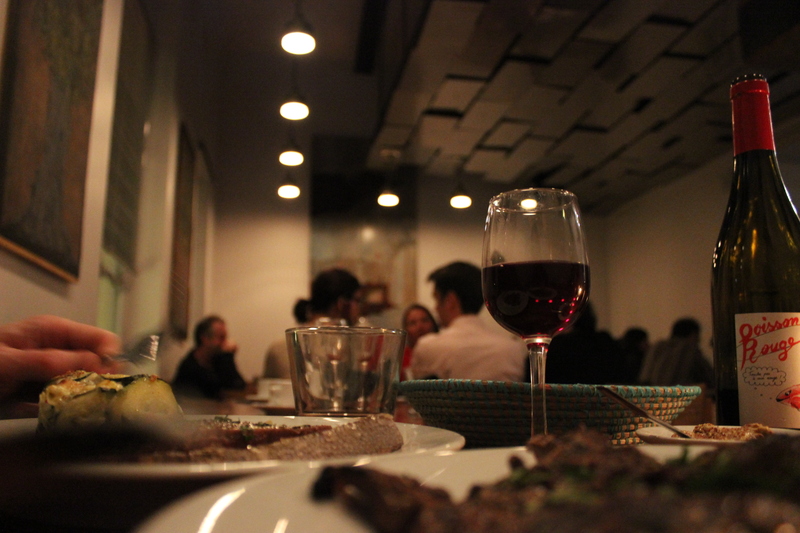 We live a five-minute walk away from the restaurant and believe it is important to support the neighborhood restaurants –that’s how the arrondissements of Paris stay vivant (alive)! We had the corner table by the window and enjoyed watching touristic boats cruise along the Seine. Bread, butter and Poisson Rouge arrived, and we got to taste this curious, organic white wine from Lanquedoc-Roussillon that actually is red by color! It tasted fruity and had I closed my eyes, I probably wouldn’t have tasted its “color”. 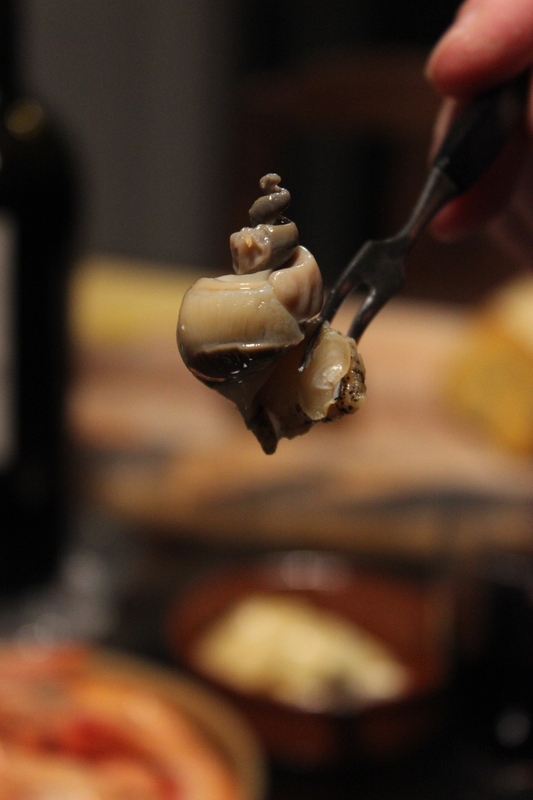 It was the most perfect pairing with oysters and our main courses: fish and meat. For starters, we shared six oysters from the Bay of Mont Saint-Michel, Britanny, and they were the best oysters I have eaten for a long time. In fact, as this oyster season (which started last September) has been very mild, I find that oysters have not been at their best this winter. 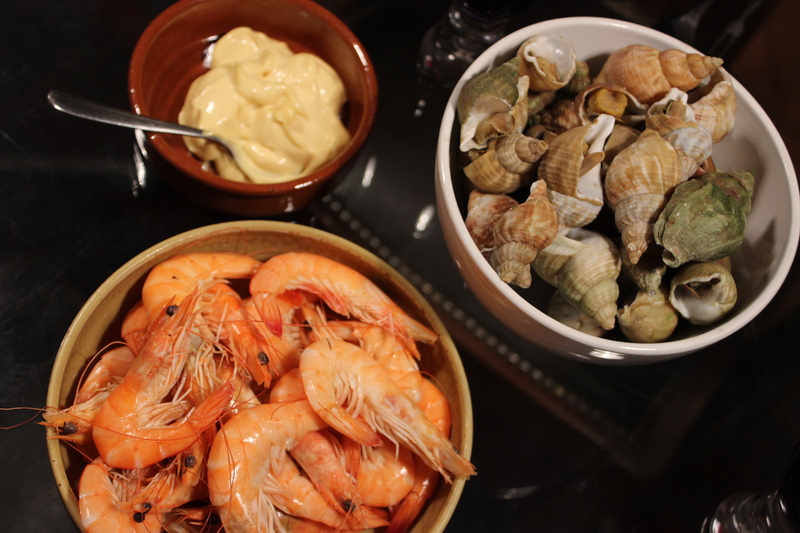 And if you follow my blog, you may remember that I regularly eat these seafood delicacies… For the main course, my husband ate tuna and I had entrecôte. Both dishes were succulent, and the taste of the fish and meat proved that the restaurant goes out of its way to find only the best products. The only regret we had was that the side dishes for both of us was the same (rather ordinary-tasting courgettes with cream). The bill came to 77€ for two, including a shared starter, two main courses and a bottle of wine (19€). Very reasonable for such great quality I consider, and we will definitely return! PS: First of all, Les Nautes recently changed the chef, so I would not count too much on the older Tripadvisor reviews. Secondly, Les Nautes also has a bar by the river, and I bet it will be one of the hottest terraces in Paris this summer! Especially during the Paris Plage when the cars cannot circulate nearby. This entry was posted in Uncategorized and tagged architecture, art, Bretagne, Brittany, cafe, design & decoration, food, Languedoc-Roussillon, organic wine, oysters, Paris, restaurant, wine, wine bar on March 22, 2014 by Miia.